Duo aim to transform Turkey and the Eastern Mediterranean into a key hub for LNG bunkering. Arkas Bunkering and Sumitomo Corporation have signed a protocol agreement for the supply of LNG bunker fuel in Turkey and nearby waters. Preparations are said to be already under way for the development of an LNG distribution network and infrastructure in Turkey and surrounding areas, with the two firms aiming to transform Turkey and the Eastern Mediterranean into a key hub for the supply of LNG bunker fuel. As part of the strategy, ship-to-ship LNG bunkering is planned to be offered for the first time in Turkey. According to Turkey's Energy Market Regulatory Authority (EMRA), Arkas recorded the country's highest bunker fuel sales figures in 2015, 2016 and 2017. Earlier this year, Arkas told Bunker Index that deliveries of marine fuel rose by 236,000 tonnes, or 37 percent, to 875,000 tonnes in 2017, up from 639,000 tonnes the previous year. The company claims to currently perform a third of all marine fuel deliveries in Turkey. Sumitomo, meanwhile, is one of Japan's largest trading firms. The company has a strong pipeline gas trading presence in the US and has been involved in an LNG liquefaction project in the US called the 'Cove Point LNG Project', as well as LNG trading and owning/operating of LNG carriers. Sumitomo is also involved in the development of ship-to-ship LNG bunkering in Tokyo Bay. 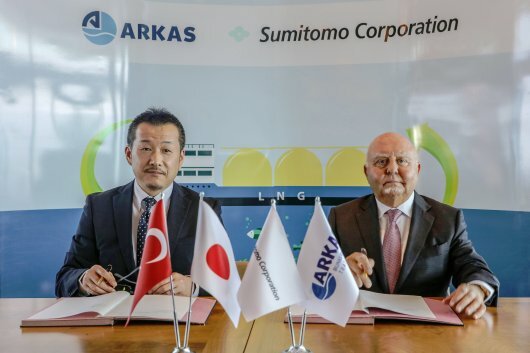 Speaking at the signing ceremony on October 16, Sumitomo's Shu Nakamura, General Manager of Oil, LPG, Offshore Business Department, said: "We are excited to conduct the protocol with Arkas Bunkering as it is an important step to supply LNG as an alternative marine fuel in Turkey and the surrounding seas. Now, we are developing ship-to-ship LNG bunkering Supply in Tokyo Bay, Japan, and believe our knowledge at Tokyo Bay will contribute to business development in Turkey. "Through the collaboration with Arkas Bunkering, we are hoping to turn Turkey into a major LNG bunkering hub in [the] East Mediterranean Sea." Arkas Holding president, Lucien Arkas, remarked: "We invest for the future in our fields of operations and make accurate projections, both of which add value not only to our company but also to our nation and clients. The importance of sustainability is becoming even more evident day by day, and using alternative fuels takes the lead as a measure in environmental preservation. Alternative fuels will be introduced for compliance with the new [IMO] regulations [in 2020]. And we, the supplier of one third of every vessel refuelling in Turkey, are initiating our LNG sales in partnership with Sumitomo Corporation, the Japanese expert of the field."